Ordinary dice, the standard dotted cubes we all know, are not as simple as they first seem. An ordinary standard die is a regular cube with its six sides numbered with dots from 1 to 6, with all opposing sides adding up to 7. The ordinary dice commonly available are not as precisely made as the perfect dice casinos use and are imperfect dice, known as drugstore or candy-store dice in the US and shop dice in the UK. They usually have recessed spots and often have rounded corners so they roll easier. Unless you are a serious gambler these are perfectly adequate for social games. Plastic is the most common material commercially used, but they can be found in many other materials; wood, stone, glass, metals, any material imaginable. 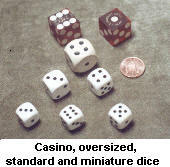 The standard Western size is just over half an inch square, but miniature dice of one-quarter inch square and oversize or giant dice from three-quarters up to an inch across are also commonly available. The dots on the faces of a die are called spots in the USA but are sometimes referred to by the more British term, pips. The standard factory made plastic shop or drugstore dice commonly available will favour some numbers more than others because some sides are lighter than the opposite low number sides due to the indentations of the spots, and because there are also other inaccuracies made in the manufacturing process. This bias will only become apparent after a very considerable number of throws. If this is a problem then you need casino precision dice. There are tactile/brail dice available with recessed faces and raised spots that can be read by touch. Opposite faces of a die should add up to 7. However, there are two ways of arranging the faces, one a mirror image of the other, so there are left and right handed dice. Today Western dice all have the same face arrangement. They are right-handed, so If the 1-spot is face up and the 2-spot is turned to face the left then the 3-spot is to the right of it. Chinese dice will have the faces the opposite way round. Japanese dice are arranged like Western dice but like other Asian dice they will have a very large and deep 1-spot painted red. Chinese and Korean dice will have a red 4-spot as well as the 1. The Chinese custom of painting the 4-spot red is said to have originated when an Emperor playing sugoruku (Japanese Backgammon) with his queen was about to lose and desperately needed fours to win the game. He cried out, threw the dice and they came up accordingly. He was so glad that he ordered that fours be painted red from then on. The emperor is said to have been Lo Ling Wong who reigned under the title Chong Tsung (AD 684 - 701) during the Ming dynasty. Whether this story is true is questionable and it has been suggested that the 4-spot is painted red because dice were imported from India where red fours are also traditional. The reason why the 1-spot is large and painted red is not clear. It is said the stark combination of black and white would be unlucky, red being considered very lucky in China. Another possibility is that it counters and balances the die, compensating for the opposite 6-spot indentations. Chinese dice come in various sizes and customarily certain sizes are preferred for particular games. (Chinese dice games include: Cockfighting, Grasping Eight, Strung Flowers, Heaven and Nine, Pursuing Sheep and Sic-Bo) Generally the traditional size ranges between 2/10ths and 7/10ths of an inch. Indian dice are also traditionally said to be spotted black and red. Why isn't known, but Indian dice traditionally have the 3- and 4-spots painted red. The ancient Hindu Sanskrit, Mahabbarata, refers to "dice, dotted black and red." Dice from Pakistan are right-handed like Western dice and are traditionally marked with a red 6-spot as well as a standard size red 1-spot. Another feature of Asian dice is the orientation of the 2- and 3-spots. You may find the spots on either the 2-spot or both the 2- and 3-spot faces arranged vertically/horizontally rather than diagonally as on Western dice. Chinese and Korean dice will also have their spots more tightly spaced together, or clustered, on each face.